Part boil two large potatoes. When the potato is cool enough to handle cut into 1cm cubes. In a large non–stick frying pan gently fry the turmeric, cumin seeds, paprika and cayenne powder for two minutes. Then add one chopped onion and two crushed cloves of garlic and the potato. Fry for 10 minutes making sure the potatoes don’t catch on the bottom of the pan. Finally add one large bag of washed spinach to the pan. 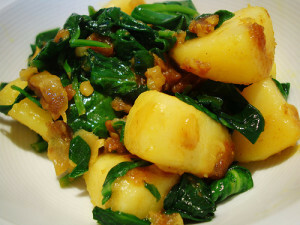 Don’t worry if the spinach is piled up, as it starts to cook it will soon reduce. Continue to cook for five minutes.